About us « WePost4U.co.uk – The distribution experts…. We are a team of Distributors which have been providing our services for many years. We have a built a reputation for providing honest and reliable service to our customers. We Guarantee all our deliveries in any area which you choose, call now to discuss your requirements with one of our distribution account managers. We plan your marketing campaign with you allowing you to choose the amount of leaflets or packages allocated in a particular area. 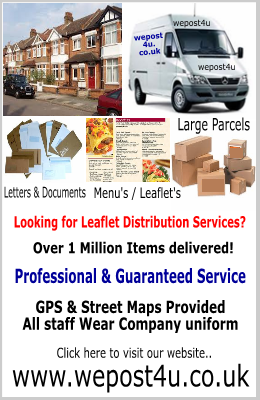 The minimum amount of leaflets we can do is 5,000 leaflets but we can do less in larger packages. 2 – We use the latest technology in tracking our staff & your deliveries, with the use of GPS navigation. 3 – We cover the whole of Greater Manchester. 4 – All staff members wear company uniforms. 5 – We provide full Street list of actual delivery.